BlackBerry CEO Thorsten Heins recently said that the tablet industry will be dead in just five years. The numbers don’t correlate with those claims, however. IDC published its latest findings on the tablet industry on Wednesday and noted that shipments increased 142.4 percent year-over-year during the first quarter of 2013. The firm said that shipments totaled 49.2 million units during the quarter, which actually represents a figure that’s larger than the entire tablet shipment figure for the first half of last year. “Tablets have shown no sign of slowing down,” IDC said. IDC expected Apple to ship 18.7 iPad units during the first quarter of this year but the Cupertino-based company shipped 19.5 million units, despite a history of tablet shipments declines in Q1. IDC said Samsung, the world’s second largest shipper of tablets, also performed well and beat the company’s expectations with 8.8 million units shipped, a 282.6 percent bump over Q1 2012 shipments. Samsung’s success took a toll on Apple’s market share, however. 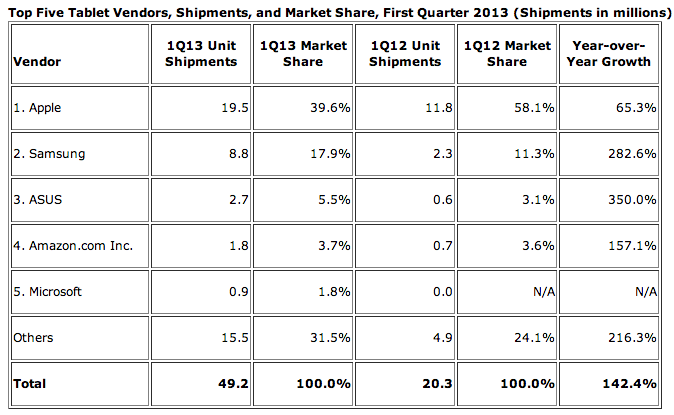 Apple had a 58.1 percent share of the market in Q1 2012 but now has a 39.6 percent market share. Meanwhile, Samsung’s share increased from 11.3 percent in Q1 2012 to 17.9 percent in Q1 2013. Asus and Amazon also saw small market share increases during the same time period. Android is the most popular tablet operating system with a 56.5 percent market share, up form 39.6 percent in Q1 2012. It’s followed by iOS with a 39.6 percent market share, down from 58.2 percent in the same quarter last year. IDC also noted that any assumptions that a smaller-screened Windows RT or Windows 8 tablet will help Microsoft’s market share are “flawed.” Microsoft’s biggest roadblock in the tablet industry is lower-priced devices, the research firm warned.